Home / Unlabelled / Want Warmth? Take a Hike! Want Warmth? Take a Hike! - Hi, friend Climate and Weather Information, in this article entitled Want Warmth? Take a Hike!, we have prepared this article well and concise to be easy to understand for you to read and can be taken inside information. hopefully the contents of the post that we write this you can understand and useful. okay, happy reading. Last night was a classic fall example of the development of a lower atmosphere inversion (temperature increasing with height). Here are the temperatures above Seattle during the past six hours (from the Seattle profiler at Sand Point, heights are in meters, temperature in C). BIG INVERSION! Temperatures increase by rougly 10 C (19F) between the surface and 800 m (2600 ft). That is roughly the height of Tiger Mountain in Issaquah. We are talking 64F at the top of Tiger Mountain and the forties at the trail head! As I have explained in the past, these inversion are associated with clear conditions during most of the night, allowing infrared radiational cooling to space from the surface. Eventually the surface cools enough so that fog forms and at low levels there is some fog around the region...but you could rapidly hike above it. And you wouldn't have to hike very high. Here is a cam shot at the Summit in Bellevue at roughly 1200 ft (thanks to Peter Benda) where you can see some fog at low levels. 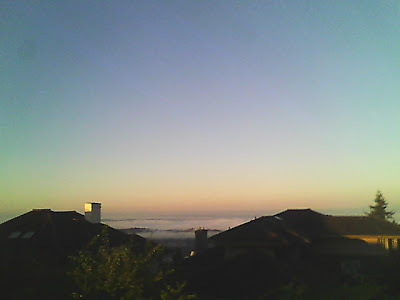 The sun will burn off the fog today and the inversion will be lost as the surface heats and warms the air adjacent to it. The weather forecasts for this weekend are rapidly shifting, but a downhill plunge is certain. Thank You and Good article Want Warmth? Take a Hike! this time, hopefully can benefit for you all. see you in other article postings.